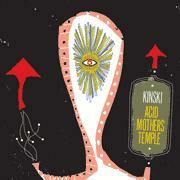 Kinski/Acid Mother’s Temple - "s/t"
This CD is both a split and a collaboration effort from US noise rockers Kinski and leaders of the Japanese psyche scene Acid Mothers Temple. It’s an odd combination, because the two bands styles don’t entirely mesh. Kinski tends towards more structure, and a down to earth kind of experimental rock reminiscent of Sonic Youth whereas Acid Mothers Temple are far more free-form, noisy, and totally space tripping. Nevertheless, the clash in styles is really only evident when one compares the first and last pieces on the album, which were the individual efforts. The actual collaborations provide for some tasty trip music, though it definitely strays more towards the AMT style than the Kinski style. Things get underway with a track from Kinski with a typically Kinski-esqe title, Fell Asleep on Your Lawn. Lucy Atkinson’s superb bass playing takes the forefront, as the other members weave their sonic textures around her throbbing, melodic ventures. The band attempts some freeform noise freaking out halfway through which actually comes off as something deliciously creepy and spine tingling. It’s a great piece, but seems a little out of place with the rest of the music on the album. It’s Nice to Hear Your Voice is the purest collaboration between the two groups. Recorded in Higashi Hiroshi’s flat in Nagoya, it features three guitars, bass, bongos, and lots of effects in a totally improvised jam session. The result is a many layered, but surprisingly mellow and wistfully dreamy expedition. Planet Crazy Gold is taken from the same jam session. Kawabata Makoto added some overdubs of himself and AMT’s bassist Tsuyama Atsushi to create a piece of music that is just as laidback and dream-like but sounds totally different. Makoto adds in tamboura, voice, spacey electronics and Atsushi’s deeply throbbing bass, giving the piece a totally psychedelic East Indian drone freakout feel to it. Next up is Virginal Plane, a 26-minute AMT space jam, the kind of chaotic acid-crazed number they can pretty much play in their sleep now, but it surprisingly comes off as one of their best. Starting with a deliciously 60’s sounding riff, the band launches into their familiar frenzied space and psych freakouts with gusto and energy, and end up creating some truly mind melting space rock to finish the album off. The Acid Mothers Temple website is at: http://www.acidmothers.com. Kinski’s website is at: http://www.kinski.net.